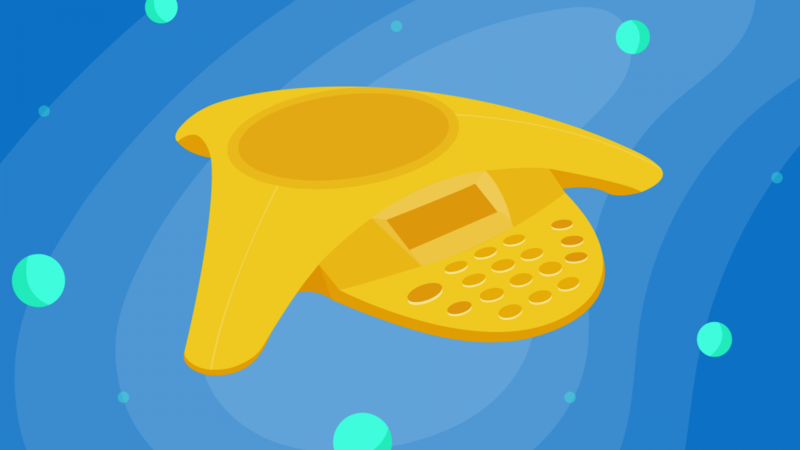 You’ve made up your mind: you’re replacing the landline solution in your business with VoIP. Your next step is finding the best VoIP conference phone on the market. You’ve worked out the ongoing cost of a VoIP phone system, you’ve worked out which conference rooms in your office are a priority, and you have a rough idea of features you need the most. You don’t want to spend your budget on solutions packed with features you don’t need, or waste hours sitting through vaguely relevant demos. This is why we created this guide: to help you find the best VoIP conference phone for your business. We focused on your budget, conference room size, potential future upgrades, and exact features your business requires. If you want to jump right to the best VoIP conference phones, below is the table of contents divided into conference room sizes so you can quickly find what suits you best. The focus on your conference room size is crucial because if you only focus on features, you might end up with a conference phone that covers a wider radius than you need, which will likely cost you more. It also goes the other way around: if you have a large space, but don’t need all the bells and whistles, you can avoid overpaying for enterprise-focused features. Related: How Many Phone Lines Do I Need for My Business? Which Features Matter the Most to You? This list of the best VoIP conference room phones below is already based on the best ones on the market. They all offer high-definition audio, they’re loved by many businesses across the world, and they allow you to easily run professional calls and remote team meetings. However, there are some refined features that could make a world of difference in your unique situation. 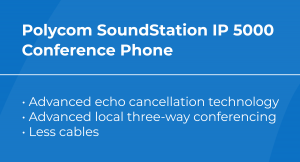 That’s why we’ve added a features table to each of the conference phones we included. Finally, you’ll notice that some VoIP conference phones hover around $300, while others go over $600, with some full collaboration kits ranging over $1,000. We didn’t shy away from listing available prices from suppliers that offer these VoIP conference phones. You shouldn’t have to waste time looking for these prices yourself; you should invest it into finding the best conference phone for your business. Related: How Much is A Business Phone Line? Small spaces like huddle rooms and offices present a range of obstacles to a good conference call; echo, feedback, and background noise are only a few. Whether you run remote team meetings or frequently speak on the phone with external partners in such spaces, things can get messy and unclear. This category lists powerful VoIP conference phones for small conference rooms and executive offices. The IP 5000 solution from Polycom brings advance audio performance to calls in executive offices and smaller conference rooms with up to 6 participants. It provides a 360º coverage and allows participants to speak in a normal voice from up to 7 feet away—and still be heard clearly. Important call information is easy to access thanks to a high-resolution backlit display. Among the main drawbacks that users mention is the time and effort it takes for configuration and firmware update. Some users spent several hours to download data, restart, and st up, while others said that having an auto provisioning system made things a lot easier. Nonetheless, they still claimed that they’d choose the IP 5000 again even with the time it took to configure them the first time around! Tales from the real world experiences with the Polycom IP 5000 show that it truly serves its purpose in a smaller room setting. Even though it appears that the clear audio pickup depends on certain elements such as leaning back or turning away, it’s still a reliable solution nonetheless. “We have this phone in the middle of a 3.5′ x 8′ rectangular table in a 14′ x 18′ conference room. The sound quality from the speaker is great and the volume goes plenty high enough to hear over a room full of noisy people. The phone picks up normal-volume voices very clearly from every position at the table, although the people at the head of the table need to be sure to speak at the phone and not lean too far back or turn away when talking. That’s what users say about the Polycom 6000. Polycom’s HD voice technology along with a high resolution display for easy, advanced call handling make it a reliable solution for mid-sized conference rooms. 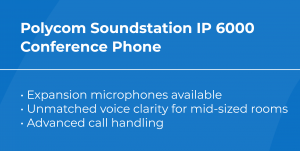 The core drawback of the Polycom Soundstation IP 6000 appears to be the setup and configuration process. Even with experienced IT professionals, it might take a couple of days to put the entire system in place. However, once it’s there, you’ll enjoy a new level of conference call quality. Like what you see here? There’s more! Let’s get you started. Cisco 7832 is a sleek, easy-to-use conference phone with 360-degree coverage of small conference rooms. This conference phone makes the most out of Cisco’s advanced technology and ensures a perfect audio experience for voices of all frequencies with up to six participants. Users can speak in a normal voice and be perfectly heard from up to 7 feet (2.1 meters) away. Small and medium-sized conference rooms are probably the most frequent of them all. Their challenge comes from the diverse shapes, varying number of participants, and outstanding audio requirements in order to not lose an important part of the conversation. Your requirements might seem unique, but the solutions below were made to work for many scenarios and are quite customizable. 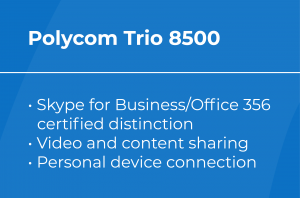 The Polycom Trio 8500 takes the conference call experiences a notch up. With it, you can start and run your meetings easily and quickly with simple navigation. It encourages user engagement with an intuitive interface and a one-touch-join calendar integration. It’s ideal for midsize conference room with its 14-feet (4.3 meter) pickup. With the legendary voice quality from Polycom, it cancels out echo and mutes non-speech noise. A drawback that seems to be present in several Polycom models happens when minor changes in the Polycom admin portal can render the phone inactive. Users agree that it doesn’t reduce the value they receive from the phone or their rating of it. It is a fault that is simply solved by resetting to default — it’s simply something to be aware of (that will hopefully be remedied in the future by Polycom). 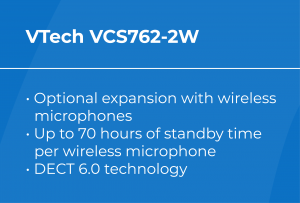 The VTech VCS752 is designed as a reliable, expandable option for your medium-sized conference rooms. With a base unit and two wireless microphones, everyone can be heard over the phone just like in real life. You can connect a total of four Bluetooth devices like smartphones and headsets and create a range of opportunities to start, run, and end your meetings over the phone. The VCS752 is equally perfect as a personal workspace device and a full-powered VoIP conference phone. One of the drawbacks that comes up is the poor audio quality when connected to a Mac Mini (MacBook Pro works fine, according to users). These users recommend a USB version, the VCS754, in this case, which has worked perfectly in their case. 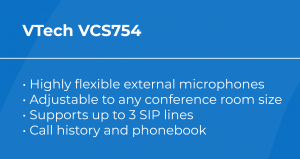 The VCS752 is praised by its users as the simple yet powerful VoIP conference phone that simply works, without the bells and whistles that most companies don’t require anyway. “Set up in conference room as generic IP phone (using POE) on Allworx Connect 731 PBX. Works great as a full duplex regular conference phone. Wireless remote mics (great feature, eliminates wire clutter) are very sensitive. The best part was connecting it to my conference room PC (Intel NUC mounted behind 60″ flat screen TV). We can assume that large conference rooms, executive offices, and similar spaces often involve 15 or more participants and imply meetings of high importance. These can often be high-pressure situations, which makes the risk of lousy experiences and unclear dialogues even worse. VoIP conference phones for large rooms listed below suit almost any situations and a broad spectrum of budgets! This kit is nothing like any other option and it genuinely provides a full remote collaboration solution. This is possible thanks to its ability to not only flawlessly transfer voice, but also video and content sharing. 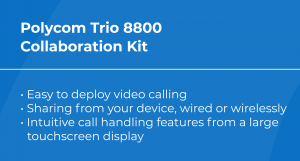 The Polycom Trio 8800 Collaboration Kit is a smart hub that will make sure you never need another conferencing solution. If you need great tech to lead highly productive remote meetings that require content and video sharing, this is it. An obvious drawback to such a robust conference phone is its price. The advanced features listed above make this far from a surprise. It’s not just a phone, but a complete hub to run the most efficient remote collaborations you ever have. “The Trio runs Polycom’s People + Content IP (PPCIP) server component. Using the free PPCIP app on a networked Windows 10 laptop, we entered the Trio’s IP address in the app’s interface, provided the password we’d configured from the Trio’s web UI and watched our desktop appear on the monitor where we could also use the app’s zoom function to zero-in on an area of interest. VTech VCS754 is among the most adjustable conference phones we’ve seen. Not only does it come with HD voice quality with built-in microphones—it also comes with four wireless microphones you can detach from the base and position throughout your space. This turns rooms of all sizes into a conference call experience that feels like everyone is in the room and not on the other side of the call. Some VTech VCS754 users reported they believed this conference phone was wireless. Others labeled the setup process as tedious and certainly not ‘plug-and-play’. In both cases, however, the outcome was a genuinely high-quality conference calling experience, which made it all worth it despite the initial drawbacks. Devices that leverage the digital enhanced cordless telecommunications, or a DECT connection, function through a base station, as opposed to directly to the computer (or phone for headsets) themselves. This adds a layer of hardware, but one base station can power multiple devices, and create a usable range far superior to anything a simply Bluetooth connection could manage. In other words, devices with a DECT connection are the most powerful setup you can create in your workspace. The VTech VCS762 is a completely wire-free solution that enables you to easily place the conference phone and its two wireless microphones anywhere you need them to be. It comes with a DECT base and docking station to charge the phone with up to 24 hours of talk time (or 12 hours for wideband audio). This phone brings a total freedom for placement in your conference room and removes the wire-tripping risk entirely. What makes the VCS762 one of the top VoIP conference phone solutions in 2019? Optional expansion with wireless microphones: pair up to two VCS850 SIP DECT Expansion Wireless Speakerphones to increase the volume and microphone pickup for 15 or more active participants. If all you need are Bluetooth-powered conference phones that are easy to travel with, the suggestions below are for you. These solutions are easy to set up anywhere, at any time, and are ready to use in seconds. Polycom VoxBox stands out as a compact speakerphone that provides a genuine, high-quality conference call experience despite its size. It’s a perfect for remote workers, as well as for group calls in small offices with lots of background noise. Due to wireless pairing, it allows for easy switching between conference rooms. To top that off, it’s the perfect choice for employees and teams who travel. Here’s the best news: Polycom VoxBox is available for less than $300. While Polycom VoxBox is extremely practical, it comes with two main drawbacks. It can pair with a maximum of 10 devices at once, which means that as more teams start using it, you’ll need to clear pairings from earlier. Another problem is the inability to personalize its device name for Bluetooth connectivity. If you only need one VoxBox, this clearly won’t be a problem, but having more than one makes it challenging to pick the correct one. Folks at Video Conferencing Australia decided to take the VoxBox for a test drive—and they weren’t disappointed. 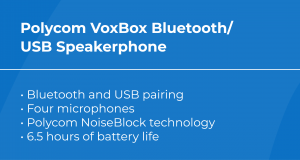 “Testing performed in a boardroom found that the VoxBox clearly picked up voices up to 2.5m from the device and even when speaking away from VoxBox, allowing only reflected sound to be captured. While this scenario is far from an ideal audio setting, the VoxBox proved it was still able to operate in such challenging environments. Plantronics Calisto 620 is a perfectly small and lightweight speakerphone that lets you run professional-level meetings wherever you are. 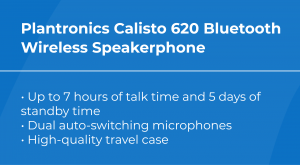 The Calisto 600 series was made for perfect portability, and the 620 provides exactly that with wireless connectivity and a simple interface to answer, end, mute, and volume-control your calls. It comes with a Bluetooth mini USB adapter so you can connect it to your PC even if it doesn’t have an already built-in Bluetooth functionality. While Calisto 620 receives plenty of feedback that suggests great sound quality and an easily portable speakerphone solution, there are two drawbacks that are coming up alongside of them. Some users shared that using Plantronics Calisto 620 with a VoIP softphone on a Mac computer was flakey. Others mentioned they have had issues with the device connecting automatically to cell phones with active calls instead of a computer that the dongle is attached to, which can be confusing when it first happens. Otherwise, it’s easily solvable. If you’ve chosen one of the suggestions from our list, you may want to expand their range with these expansion microphones. If your conference phone of choice is the Polycom RealPresence Trio 8500 or 8800, the Trio Expansion Microphones will be a useful addition to it. They each connect with a 7-feet (2.1 meter) wire and have a 6 meter range with a 360-degree coverage. Just like the rest of the Polycom range, they provide a high-quality, inclusive collaborative conferencing experience. The VCS850 is the perfect addition to the VCS752 conference phone. It has a full-duplex speakerphone in base, so callers can speak and be heard at the same time just like in a face-to-face meeting. It’s a great way to hold a conference call in a large conference room, because you can pair up to three VCS850 expansion speakerphones to increase the volume. This also increases the microphone pickup to 27 or more active participants. Wireless talk time is up to 12 hours on one charge, and standby time is up to 70 hours. You never have to worry about losing a charge in the middle of the meeting. When you’ve reviewed your feature requirements, conference room size, and your budget, it’s time to make a decision on the best VoIP conference phone for your needs. By now you know that VoIP conference phones save you time and money by letting you run your overall communications with ease. Here at Nextiva, we aim to be the partner you can trust and bring you reliable VoIP conferencing as the backbone of your business.